Today marks the fifth-year anniversary of your death. Not a long time, yet it feels like an age ago. Like the photo above. Do you remember that day? 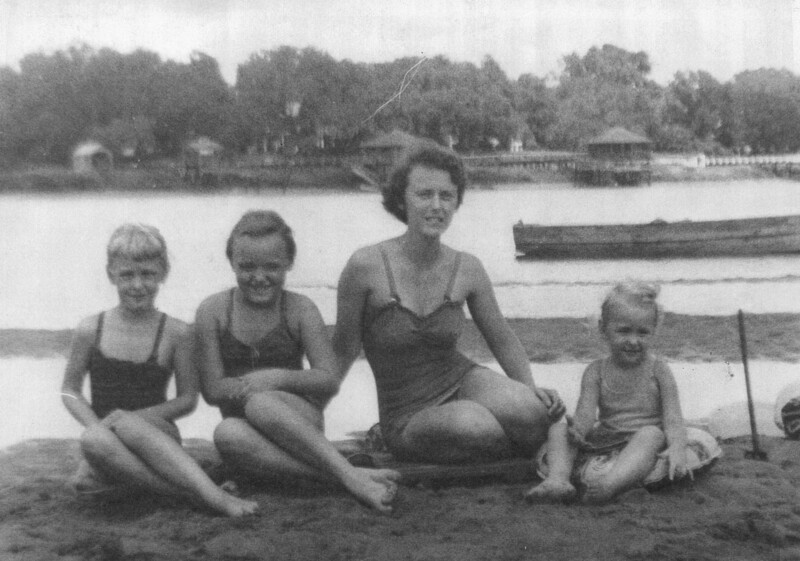 It was 1951, our first year living on the river in the Deep South. Sister #4 came along in 1953. I remember how dirty and gritty the sandbar was. More like a combination of grit and mud. Not like the clean white sand on the beach at Tybee Island. I also remember that you were nervous about staying too long because the incoming tide would have a swift current. I’m still trying to understand the mystery of our relationship. That’s why I’m trying something new in this letter–focusing on things we share that connect us in a positive way. Here’s my first attempt at a list. We’re introverts who prefer order to disorder, and quiet to noise. Thankfully, I never felt I had to chatter with you to fill the empty spaces. They were sometimes uncomfortable, but they weren’t as uncomfortable as chit-chat. We’re inquisitive. We like to read books, travel and have great adventures. Our voyage to the sandbar made a big impression on me. As did our long road-trips in the car, especially across the United States and from the Deep South to the Northeast. We love gardens, being outdoors, and most creatures great and small. Remember the little baby flying squirrels you rescued one night because they’d fallen from their nest? We fed them milk with little eye-droppers and then you put them back in the morning—hoping their mother would find them. How about zoos and watching animal behavior in general? Often more fun than watching some human beings we’ve known. And, of course, music and theology. I think they go together, don’t you? Even though you didn’t teach me piano, I always knew you enjoyed hearing me play, and that this made you proud of me. Here’s another: Better to have quiet evenings at home with simple food, simply cooked, than a banquet where we have to get all dressed up and, as you put it, ‘mind our P’s and Q’s.’ I still don’t know what that means, but I still feel the same way about fancy occasions. We’re practical. We keep our feet on the ground, and are usually able to stay calm in a storm. Even though we might be afraid. We’re also reliable and trustworthy. If we say we’ll do it, we generally do it. You didn’t always think I did that so well when I was a child. But it’s still the truth about me! My big problem is saying I’ll do more than I have time or energy to do. But that’s another issue—and right now I’m sticking with the positive things. Even though we both like to be appreciated, we’re not out there beating our own drums. We don’t need a lot of hoopla and attention. We tend to be more reserved in our demeanor, and even embarrassed when people want to pick us out of a crowd (even though we may like it on the inside). I also think both of us are team players—loyal and interested in helping the team do well. We also work well alone. I think that’s because we’re introverts and we like the way being alone sometimes helps us get more accomplished. Well, what do you think? Did I come close? Would you add anything? I see I’ve used up almost all my space for this letter. So I’ll have to write a follow-up with a few other things I’ve been thinking about. That would be my personal observations about you—from my adult point of view—and several questions I would love to ask you. Do I miss you? Sometimes. Yet I’m glad your suffering came to a close five years ago so you could rest. I think we’re on the same wavelength there. Thanks, Fran.